Tim Hicks takes a corner on his leaning trike during the April 24 & 25th 2010 Indy Fest HPRA HPV races. 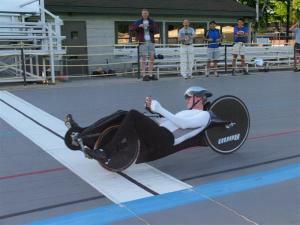 Saturday races included the twisty trike race, and on the veoldrome, 200 meter sprints, and a 50 lap race. Sunday's race was a wet 20 lap race at Pioneer park. Click here for results and here for the pictures.